Okay -- obsessed, really. Ever since I found the album cover featured on the soon-to-be-released book, And You Shall Know Us by the Trail of our Vinyl, and learned that the Mike Bradyberg-like dad was and still is, in fact, a fairly well-known cantor in the New York City area named Sol Zim, I have spent much of my leisure time (of which there is admittedly an excess) searching for more photos of him and his lovely family. 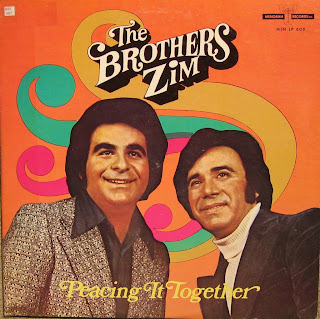 Both separately and together, the Zims recorded a pretty impressive number of albums, if even for a somewhat narrow audience. Keeping in mind that today virtually anyone can record an album or publish their writing without much, if any, cost or need for representation, I'd have to say that these two guys did pretty well for themselves. I leave you now with the psychedelic image of The Brothers Zim forever imprinted upon your traumatized cerebral cortex. Thank you for the wonderful review of my blog! I am honored that a writer & former editor likes what I have to say. And thank you for following me...my other two followers were getting lonely. You are hysterical!!!! And you are making me miss my home....New York! I'm glad you found your way to my blog and I hope you'll come back soon! I'm lovin this vinyl cover - so retro fab! Welcome to the world of blogging and thanks for coming by to visit my blog. I love having new friends!!! Cheryl, is this the same Paul Zim I would listen to every passover at the seder table? Obviously, no one in my family had a singing voice so my dad used to keep a cassette tape player with Paul Zim's Passover Seder so we could sing along with Mr. Paul Zim and his group, this way all our horrible voices would be drowned out! Somehow one year the tape mysteriously disappeared and now we painfully try to recreate the Paul Zim Seder. Baruch Ha-macoum!!!! Oy Vey I say!! !